Enjoy the romance, ambience, and luxury of a fireplace, with or without heat, in any room in your home any time of year. 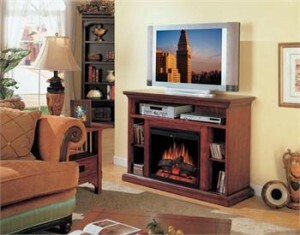 The 23″ Hollywood Fireplace and Home Theater with Electric Insert requires no outside venting. Simply plug into any standard 120-volt outlet, and you are ready to enjoy the romance of a fire without any of the inconvenience. Bringing a new level of design, style and craftsmanship to the fireplace industry, this fireplace belongs in the finest of homes and will be admired for years to come. The Hollywood combines the function of an efficient heat producing fireplace with the latest styles in a quality, handcrafted mantel.